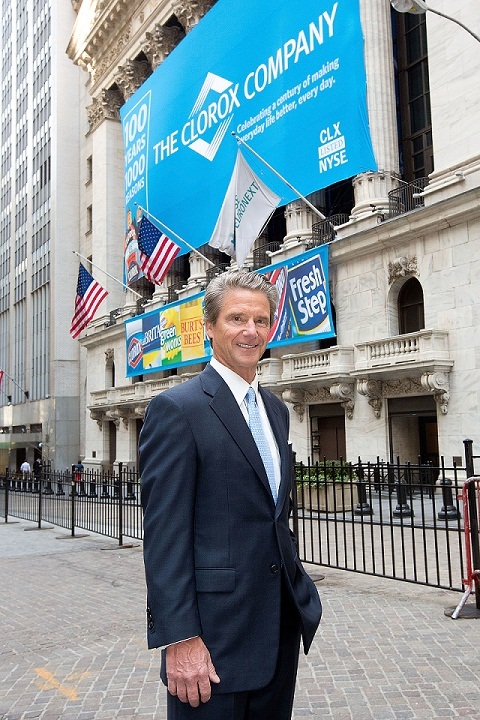 Clorox CEO Don Knauss was a guest on Chris Townsend’s radio show on Tuesday. He spoke optimistically of the possibility of building a ballpark for the A’s at Howard Terminal. It’s been about 8 years since anyone connected with the A’s has taken a serious look at the Jack London Square area and conditions have changed drastically since then. (1) In 2005, the Port of Oakland needed the Howard Terminal area for its operations. Today, however, the Port is operating at less than 50% capacity, and its business would not be hurt by giving up the space for a ballpark. (2) The pollution problem has been shown to be much less pervasive than previously thought and would not require an extraordinary expenditure of funds for remediation. (3) A tremendous amount of money has been invested in the JLS area in the last few years. Anyone who’s been paying attention knows that JLS has blossomed into a thriving restaurant and entertainment venue. Townsend pressed Knauss about why Knauss’ group hasn’t made an offer to buy the A’s. (He has said in the past that there is a group in Oakland that is interested in buying the A’s; unfortunately, Lew Wolff and John Fisher have shown no inclination to sell.) Knauss said he felt it’s important to respect MLB’s protocol in that regard and to first try to work with current ownership on plans for a new ballpark, although he acknowledged that “getting the team to the table has been a struggle.” When asked whether Clorox would want to buy naming rights to a new stadium, Knauss responded with positive enthusiasm. Townsend also mentioned that a vote that will be necessary before any public funds can be spent on a ballpark in San Jose. He asked Knauss if he believed Oakland voters would approve such spending. Knauss replied that Oakland and Alameda County have some funds set aside for this project, and, most important, no public vote will be required for those funds to be utilized. Knauss said he expects that within a few weeks a lease extension for the A’s at the Coliseum will be completed and the Howard Terminal site will be presented to Major League Baseball as a viable option for a new stadium. With a solid alternative in hand, perhaps Bud Selig can convince his old fraternity brother either to work with Oakland or to sell the team to Knauss’ group. In either case, the perils of litigation with San Jose would be avoided. We couldn’t agree more with Don Knauss: The A’s deserve a world-class ballpark and Oakland deserves to keep the A’s!! Yesterday Lew Wolff was on 95.7-The Game and let us give you the breaking news that came out of it: NOTHING. That’s right, nothing. Nothing at all. Sometimes we wonder why we even brother tuning in for such things. It’s borderline masochism. It’s not like Lew’s going to come out and say that he loves everything about Oakland, such as the fans, Lake Merritt and even the hipsters in Temescal. No, never. I would have been better off just going for a jog after work, but there I was running into my house to turn on the radio like it was FDR delivering a WWII speech. Instead, all we got from Wolff’s chat with Chris Townsend and Brandon Tierney was the same ol’ same ol’. He used the old line about the infamous binder taking an hour and 45 minutes to go through. A few stale jokes about his age. And, of course, some whining. It was good ol’ Grandpa Lew, who just wants some free stadiums and, darn it, no one is letting him. Boo-hoo. That alone is not blogworthy. However, if you tune into the podcast (here) and wait until about the 3:30 mark, Wolff starts talking about the budget and keeping team payroll within the budget. After listening to Wolff’s comments, it’s pretty clear that he values short-term profit over winning. But that’s not news. What really grinds our gears was this quote (paraphrasing): “If we win a World Series but lose $40 million, I don’t want to do that because it would feel like we just bought it.” Say what? Seriously? Why are you in the baseball business, Lew? The pinnacle of success in baseball is a World Series victory and nothing else. Also, what happened to the notion of “spending money to make money” or “short-term losses for long-term gains?” Those sayings have been in the business lexicon forever, even before Sharper Image starting selling those motivational posters. Brandon Tierney asked Wolff the following: If the team spent money and put a winning team on the field, wouldn’t the fans respond with increased ticket sales? Wolff simply responded with more silliness. First of all, he got the playoff year wrong (2005 vs. 2006), but then he went on to say that the year after the last playoff run, season ticket sales were down. Let’s zoom back five or six years. In the offseason before the 2006 season, Wolff tarped off the 3rd deck and then announced the ill-fated and divisive Fremont move. The fan base was simply rejecting the direction that Wolff was taking the franchise. Couple those things with ticket price increases and customer-service reductions, and it doesn’t take a Wall Street analyst to know all of that is going to lead to reduced sales. There is more from the interview. Listen to it if you want. One more takeaway from it is that Wolff stubbornly feels that the move to San Jose will happen, despite the fact that many of his supporters have expressed their doubts. 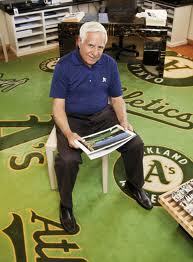 Let us ask you this, A’s fans: how long do you think that Lew Wolff will actually be fighting for you? Was he ever fighting for you? Losing games for profit is not what baseball is supposed to be about. Ken Burns didn’t make a documentary about how awesome billionaires are. Kevin Costner did not star in a movie about rich people coming out of cornfields whining about how much money could be made. That’s not baseball. If I cared that much about rich people making money I would be watching streaming footage of Goldman Sachs executives. No, thank you. 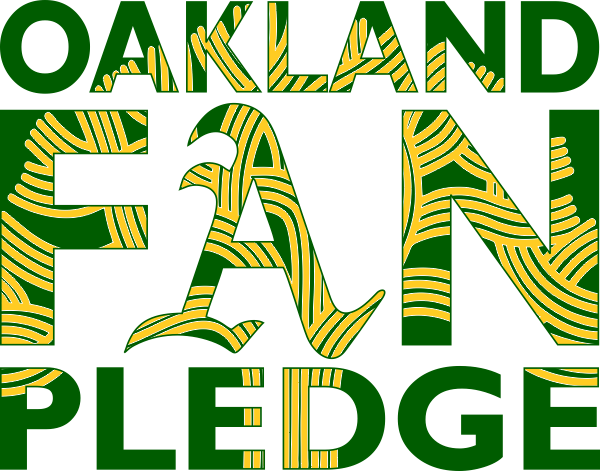 Oakland Fan Pledge, as its name suggests, is asking A’s fans to pledge they will buy season tickets for a new A’s baseball-only ballpark in Oakland. The group was founded by John Hansen and John Jackson, two die-hard A’s fans who say they’ve been good friends for decades, ever since they met in Oakland as classmates while attending elementary school near Lake Merritt. In just a handful of weeks, OFP has received nearly 1,300 pledges, totaling more than $3 million in potential sales (at last count). If you haven’t yet, we urge all A’s fans to make a pledge and be part of a rising wave of Oakland baseball fans fighting to keep the A’s in Oakland. Keep up the great work, John and John. We’re confident that this 18-year saga one day will end happily for Oakland and the Athletics. And we look forward to that day when all A’s fans can celebrate the A’s future in Oakland at a new ballpark on the Oakland waterfront.